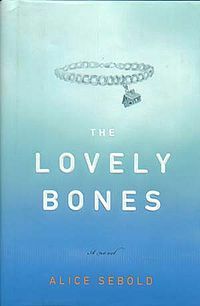 The Lovely bones - Brian Eno - "The Big Ship"
What did anda think of the casting choices for the film? pilihan fans: Really great. They pretty much got it right. Did anda like the movie atau the book better? Who is your favourite actor who stars in the film? Why did Susie's mother dream about a girl in India being burned alive? Do anda believe in that there is something after death,that we will find our heaven like Susie did? Help me! What does Buckley whisper to his dad when they are hugging, right after he tells his dad that "Susie came into my room and kissed me on the cheek." I've skipped back to that line over and over again, and still can't figure it out! What tahun was the book published?